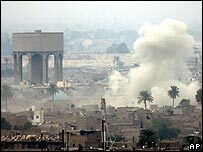 US and Iraqi troops have killed at least 50 militants during a battle in a Sunni stronghold of Baghdad, the Iraqi defence ministry says. US President George W Bush is expected on Wednesday to outline a new strategy for Iraq which may include sending 20,000 more US troops to Baghdad. A first wave of extra troops will go into Iraq before the end of the month, a senior defence official has said, quoted by the Associated Press news agency. But many Democrats - who now control the US Congress - are against further deployments in Iraq. Senator Edward Kennedy, a Democrat and long-time critic of the war, has proposed legislation requiring congressional approval for funds needed to send more troops to Iraq. UK Prime Minister Tony Blair said the way Saddam Hussein's execution was carried out was "completely wrong"
The military reportedly sent troops to arrest those responsible for the killings, triggering the fighting. Early on Tuesday, gunmen attacked Iraqi military checkpoints leading to the cemetery. The Iraqi forces called for support from their US counterparts, and together they sealed off the district and began house-to-house raids. The Iraqi defence ministry said 21 militants - including seven foreigners - were arrested. The fighting came hours after Prime Minister Nouri Maliki promised tough action against illegal armed groups. "All our political, economic, media, security and military resources will be used to support the operations which the capital Baghdad is waiting for," he said.